Established in the year 2011, we, Sun Roofing Company, is counted amongst the major supplier, distributor and manufacturer of Metal Roofing Sheets & Related Accessories. Our quality range includes Decking Sheets, Polycarbonate Sheets, Profile Sheets & Pre Painted Roofing Sheets. We have a sound infrastructure spread across a sprawling area in the industrial township of Bhiwandi, Maharashtra. The products are manufactured in a wide range of sizes conforming to the specific customer requirements. The products are manufactured using raw material conforming to strict quality standards and is procured from reputed suppliers. Our products cater to a variety of industries like industrial warehouses, Railways, Sugar and Paper Mills, Auto Industry, Chemical and Fertilizer Plants, Petrochemical Projects etc. Our organization is led by "Mr. Abhishek Kashikar", who is counted among the best in the industry and inspires us to achieve the goal of attaining complete customer satisfaction. He is driving force behind our pursuit of excellence and has scripted the success story of the organization. His acute business acumen and extensive technical knowledge have propelled the tremendous growth of the organization. We at Sun Roofing Company aim in manufacturing a varied range of new steel products using cost effective production techniques. Our team of experts will always ensure that we achieve the highest levels in customer satisfaction. Our organization has a well developed modern infrastructure, equipped with all state-of-the-art facilities. With our spacious warehouse facility, we store each and every product in a secured manner and reduce transit and storage losses. Our product and service range is customized as per detailed specifications of our clients to provide them optimum satisfaction. Being a client centric organization, we strive hard to achieve utmost customer satisfaction by providing them with admirable Roofing Services. We render all our services in accordance with the specifications detailed by the customers to achieve their maximum satisfaction. Backed by a highly proficient and diligent team of professionals, we are able to provide the superlative quality Galvanized Sheets to our precious patrons. Aware of their respective domains, these professionals are well versed with the technology. Incorporate the same while manufacturing the product range, these professionals work in close coordination with each other. With the assistance of our professionals, we are able to deliver our products in stipulated time frame. 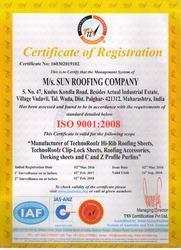 WE ARE AN ISO CERTIFIED COMPANY .